Well, we made it through the Full Moon- whew! Felt like a rather intense one. Emotions were strong in my part of the world, but I personally believe the Full Moon cycle brings a release of that "stuff" as we move through the phase. As if there wasn't enough going on with the Full Moon in Aquarius and a Blue Moon and a ton of energy, it turns out, starting at sunset last night through to sunset tonight, it is Lammas. 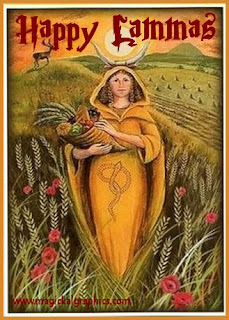 I got today's picture from a blog posting that explains Lammas in detail http://spiritblogger.wordpress.com/2010/08/02/spirit-message-of-the-day-celebrate-pre-harvest-lammas-2010/ In a nutshell, Lammas is a Pagan ritual intended to celebrate the beginning of harvest. We'Moon 2012 explains Lammas as being a time to not only celebrate your own harvest, but also as a time to be aware of others who might not have as much abundance. It is described as a time to care for the earth and all that are in it. That makes sense during this Aquarius Full Moon type energy . http://pixiedusthealing.blogspot.ca/2012/08/full-moon-in-aquarious.html It isn't just "all about me", it's also about "me sharing with the world", which really in fact is, "all about me"! Tasa Wolfstar, as written in We'Moon 2012, describes a Lammas dance which involves the Mothers of the Four Directions; sun mother, moon mother, earth mother, and queen. She says each mother steps forward in the dance and the other three bow to her as queen. In the moment of being queen, that mother draws the power of transformation, the power of filing and sustaining self for the seasons to come. As each steps out of the circle another moves in and in this way the world is flooded with abundance. In my opinion, that's a theme of flow. It's about drawing in transformative power and filing yourself. But it isn't about holding that power within. It never seems to be about holding. It's about releasing that power outside of yourself so the flow can continue both within and without. That's the balancing nature of energy. It isn't always easy to let go of that power. When you feel filled with power, there can be a tendency to hold on to it, saving it for a really tough time maybe. I think it might also tend to be "human nature" that in the moment you feel that internal power and have the desire to share it, you might just lean a bit to a manipulative, self-centered, sharing. Giving can be a bit domineering and it may be hard to give without expecting something in return. After all, that's what we have built an entire monetary system on. If I give you money, you give me something of equal value and vice versa. We have great expectations based on giving and receiving and that really isn't the same thing as flow. This time of "abundance meant to be shared" celebration, might be enhanced with a few drops of the Bach Flower Chicory. Chicory is one of those Bach Flowers that is sometimes hard to describe in a positive way. It's indicated when you feel possessive or over-protective. Most people are unaware they are feeling this, or expressing this, when they are in the moment. It's often indicated for parents that are demanding constant attention and service from their children (particularly once the children become adults). It's for the parent that feels they are not properly rewarded for all the things they have done. When in a Chicory state you see service to others as a "duty". And a duty that should have some "pay back". Chicory can help you offer genuine maternal love and I think that's actually the spirit of Lammas. It's about flowing the abundance that was given to you by the earth, a higher power, whatever you believe in, right back out to others without expecting anything in return. When you don't expect something from the person you give to, you actually receive more abundance from source itself. When balanced, the Chicory person doesn't need thanks and accolades from those to whom they serve. In the balanced Chicory state you already feel self-assured and filled- all on your own. According to the Pagan tradition, Lammas was celebrated by making bread from the first wheat harvested on this day. The grain was harvested, the bread was made, and then the loaf was shared in celebration with others. In Sweet Shack & Bach Bar, http://www.brylerpublications.com/books/fiction/sweet-shack-and-bach-bar Wise Woman served Vanilla Cardamon pudding to Lola. Both Cardamon and Vanilla resonate with the Second Chakra and you just can't beat how good this pudding tastes or how good it smells while cooking. http://pixiedusthealing.blogspot.ca/2010/12/chakra-foods-for-sacral-chakra.html It's easy to make, doesn't require much heat or time, doesn't involve a lot of other ingredients, and makes enough to share! The recipe is included in the book. Merlin is a bit addicted. 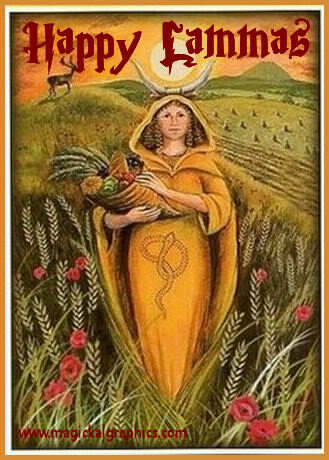 Happy Lammas. Enjoy the abundance and share the flow!